Mounts the canopy to your 2 post ROP frames except Hoop Type Frame. We need the measurement of the top of the ROP and the size of the ROP Tubing used. Put sizes in the comments section of the order form. 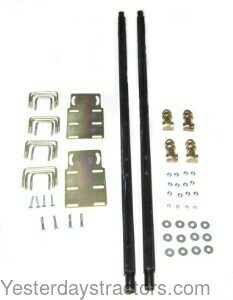 New, aftermarket Canopy Mounting Kit, 2 Post for sale with a solid manufacturer warranty. In addition, we have a generous 30-day return policy if this Canopy Mounting Kit, 2 Post for all John Deere tractors needs to be returned for any reason. Please see our Parts Warranty and Return Policy links on your left for complete details before returning.